Results from smaller clinical trials are promising, but we can't make solid conclusions yet (14, 15). 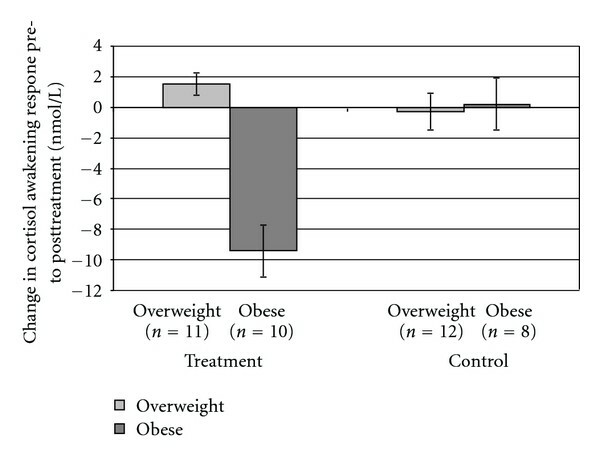 Average weight change by group condition among overweight versus obese participants. 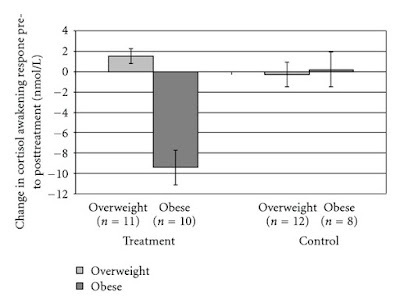 Mindfulness dramatically reduced cortisol awakening response in obese but not overweight subjects. 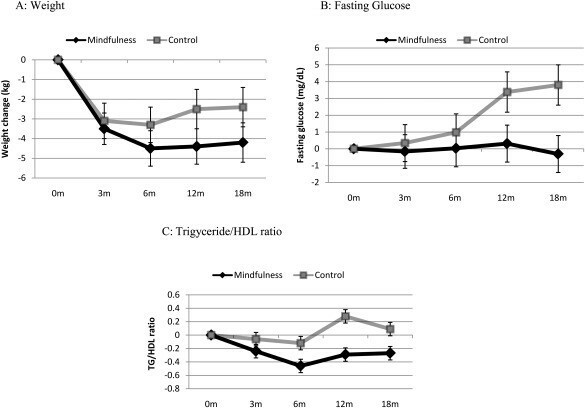 Changes in weight, fasting glucose, and triglyceride/HDL ratio for mindfulness and control groups from baseline to 18 months. Lower values are better for all 3 measures. The mechanism for these changes is still unknown, but it's suspected that mindfulness can alter the autonomic nervous system, which regulates blood pressure, breathing, and heart rate (17). These bacteria make up the human microbiome, mostly located in the large intestine or "gut." 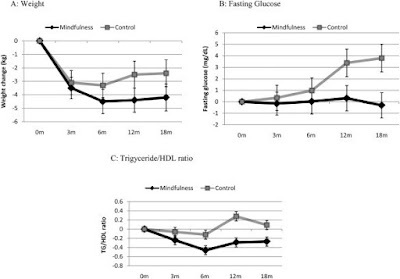 Alterations and imbalances in the microbiome may contribute to inflammation, weakened immunity, and maybe even weight gain(19). Increased stress seems to dramatically alter the types of bacteria in a mouse's gut, which has been observed multiple times. Irritable bowel syndrome (IBS) is a common health problem, affecting 7-10 percent of the world population. The exact causes of IBS are unknown, but it's likely multifactorial. Gut microbiome imbalance, stress and other psychological issues are suspected triggers (19, 23, 24, 25). Other small studies have shown 30 minutes of mindfulness activity per day to help with IBS symptoms, although these weren't well-designed (27, 28). The number of new cases per year is expected to increase 68% by 2030. Although it could have exciting implications for cancer treatment, it's important to remember this is an emerging area of research. Mindfulness should not replace standard cancer care, but instead be used alongside it.